So What’s Jackfruit? – WellPsyche. Beyond. So if you are new to this whole plant-based diet world, you’re likely learning some new terms and seeing some strange new products mentioned here. I’ll admit, when I first started my own journey to plant-based eating, jackfruit really weirded me out. I read about it and was all like “no thanks, fruit as meat? I’ll pass.” Maybe it was the passage of time with no meat or maybe I’ve actually become more adventurous with my cooking as I’ve moved along this journey but one day, I caved and bought a can of this weird fruit. Once I finally cooked with some jackfruit, I was sold. So, if the idea of giving up pulled pork sandwiches makes you want to cry, you’re welcome. I’d like to add that I am a big texture person. As in, I can’t stand certain textures of foods, especially eating things that are “all soft” with no crunch. Sweet and Sour Slaw is the perfect fix for what otherwise would be a pretty soft sandwich. For me the slaw is a must have and if I’m ever eating leftovers (it reheats well) and don’t have any slaw, I’ll just pile a few potato chips on top to satisfy my need for crunch. But seriously, the slaw is much better. It’s grown throughout tropical regions of the world and is the national fruit of Bangladesh. You can buy jackfruit raw and whole and prepare it yourself or you can make your life easier and just buy it in a can. 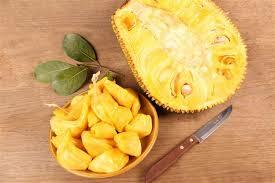 Jackfruit is also delicious on top of nacho’s or on a baked potato.